I just finished reading this fascinating book by Jeannie Marshall, a Canadian now living in Rome with her husband and son Nico. 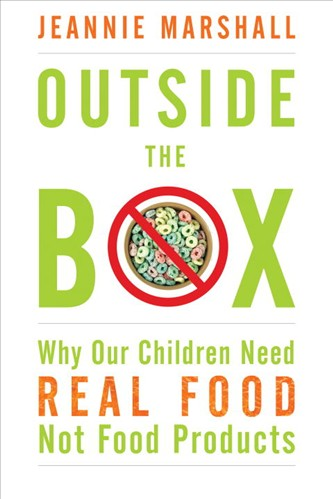 Marshall’s book tells the story of her family’s love affair with Italian food–which is under threat from food marketing, fast food, junk food, and processed foods of all sorts, which are marketed with ever-increasing intensity at Italian children. Sound familiar? Marshall points to an alarming trend: traditional food culture is alive and well, it seems, amongst Italian adults, but Italian children are apparently starting to eat more like stereotypical North Americans. Marshall talks about the junk food offered at birthday parties, and the apparent innocence (‘it’s just a harmless little treat’) with which Italians offer processed foods of all kinds to their children. And she notes some of the consequences, including an alarming rise in child obesity rates: Italy is not far behind the US, and at current trends is catching up rather quickly! Her anecdotes about her teaching Nico about traditional food culture reveal the tensions and fault lines in contemporary Italian eating habits (which are very similar to those in France). Marshall’s book contains lovely anecdotes about some of the food traditions that are alive and well in Italy — such as local markets, and the two-course hot lunch served at schools, featuring everything from spicy arugula to nettle salad (yup – nettles! ), pumpkin risotto, fish served with tomatoes and capers, and sautéed zucchini flowers. Yum. Sigh. These passages were fascinating for their similarity to school lunches passages remind me of the school lunches served in France (although I have to admit the Italian dishes sound better than that served at the average French cantine!). The book is a marvellous read because the story is so deceptively simple: one family’s experience of Italian food (with luscious, lingering descriptions of fresh produce and oh-so-satisfying meals). But this is much more than a personal story (fascinating as it is). Marshall also discusses food marketing, nutrition policy, and the food industry–using examples from around the world. Her personal story is thus placed in a broader context; the book is both informative yet accessibly written (not an easy task!). Bravo for a great book! Thanks, Karen. I just finished your book and really respect your willingness to change your families eating habits even thought it is incredibly challenging. I am an professor of exercise physiology and teach courses in nutrition at a large university. It is amazing how little our students know about food education and reading your last segment of the book discussing your daughter’s daycare and the unwillingness to teach good eating habits, it is no wonder that the college students that I get are utterly confused about what healthy eating is. We need to start children at an early age with food education, and being the mother to a very busy toddler, I have the perfect little student right at home. My grandparents on both sides came from Italy, so I have a vested interested in preserving Italian eating traditions for my family. I will definitely be reading this book. Grazie mille! Sounds like a wonderful book. I’ll definitely be checking this one out. Thanks, Karen!